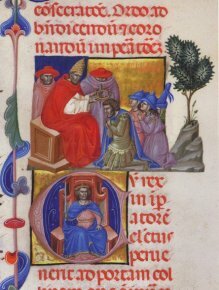 Bologna and the Autun Pontifical. Unknown Masterpieces of the Early Trecento, 1330-1440. Autun, Musée Rolin, from 12 September to 9 December 2012. While a considerable number of exhibitions are on offer in Paris - probably too many as it is practically impossible to see them all - the provinces, however also provide enticing choices. We should thus not overlook regional museums some of which are currently presenting remarkable shows. They are well worth the trip, allowing visitors to discover at the same time collections which are sometimes unfamiliar. 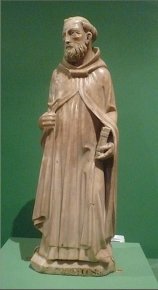 This is the case today for the Musée Rolin in Autun, in a partnership with the Louvre involving a series of five exhibitions. The one presented here is thus the first one and is organized around the discovery in 2008, during the Journées du Patrimoine, of a valuable illuminated manuscript held by the Autun bishopric, a pontifical (ill. 1), that is a "liturgical book reserved for the bishop to celebrate the ceremonies corresponding to his position". 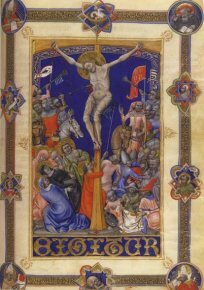 Totally unknown until now, this Italian work immediately identified as a masterpiece of Bolognese illumination from the first half of the Trecento, resulted in a veritable police investigation in order to find out where it came from and how it arrived in Autun. The findings were far from conclusive : no mention was found in old documents. The first trace of its presence here comes from a book published in 1899 reproducing its frontispiece. It is therefore possible that this manuscript was presented to the bishopric in Autun in the second half of the 19th century. After seemingly disappearing for over a century, then resurfacing again recently, it was placed on deposit at the Autun library where it can now be consulted by specialists. This remarkable exhibition with an equally thorough catalogue, studies it in a very erudite manner also placing it in context at the time it was created. We know that the first half of the 14th century in Italy ended abruptly in 1348 with the plague which struck a large part of the population and which also had grave consequences for art history. Bologna was no exception : the sudden artistic flourishing of the 1330’s was interrupted by the epidemic. After an introduction covering the rediscovery of the manuscript, the exhibition looks at the two decades of 1330-1340, particularly rich on an artistic level. There are many illuminated manuscripts from French libraries (BnF, Bordeaux...) but also from the Vatican. Indeed, one of the most beautiful items displayed here comes from the Vatican Apostolic Library, the Missal of Cardinal Bertrand de Dreux (ill. 2) by an anonymous painter known as Master of 1346. This artist did not however collaborate in the illuminations of the Autun pontifical which specialists today acknowledge was produced by three different persons. The first, notably the author of 43 of the 54 initials in the volume, is considered to be the main contributor. Influenced by the art of Giotto, he is known under the name of Master du Gratien of Paris (also named Master du Décret de Gratien, in the catalogue). The work which gave him this name, owned by the BnF, is also on view here. This figure, an important actor in the work of illumination in Bologna, was joined by two collaborators whose art, according to the catalogue entry, is considered as "more sophisticated". 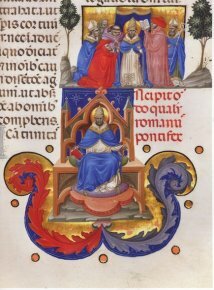 One is acknowledged as having participated in the illumination of three other manuscripts, the second only for this pontifical where he painted two folios. These discussions concerning the respective artists are often difficult to follow. In fact, we come up against the restrictions imposed by an exhibition for viewing illuminated books : it is impossible to show more than one page (two if they appear side by side). This constraint can nevertheless be eluded partly thanks to digitization, presented at the end of the exhibition by projecting images of excellent quality of the entire work allowing visitors to "turn the pages". However, we regret that the catalogue, which provides extensive reproductions of the pontifical paintings, does not specify the name of the authors in the legends, forcing readers to refer back to the entry text each time they need to identify the artist in question. The exhibition does not only present illuminated books. It also looks at the conditions surrounding artistic production in Bologna in the first half of the century, assembling paintings, sculptures and art objects from this city. 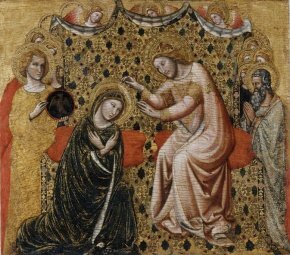 Thus, we can admire notably sculptures by Giovanni di Balduccio, an artist from Pisa (ill. 4), panels by Vitale da Bologna (ill. 5), the great Bolognese painter of that period, as well as fabrics, reliquaries, chalices and crosses whose equivalent are represented in the pontifical miniatures. Despite its great erudition on an often complex subject, the beauty and importance of the objects along with a clearly explained presentation make this exhibition interesting even for the uninitiated, proof that it is not always necessary to choose between the general public and a specialized audience, and that it is possible to reach both. In concluding, we would like to point out that the city of Autun is planning to enlarge the museum by annexing the remarkable prison in the adjoining building, a fascinating example of panoptical architecture. This is an excellent initiative which we will discuss on another occasion though care must be taken that this magnificent architecture is not in any way altered by its new use. Curators : François Avril, Brigitte Maurice Chabard, Massimo Medica. Visitor information : Musée Rolin, 5 rue des Bancs, 71400 Autun. Tel : +33 (0)3 85 52 09 76. Open every day except Tuesday from 10 am to 5 pm, Saturday and Sunday from 10 am to 1 pm and 2 pm to 5 pm. Admission : € (reduced : 5€). Internet website.